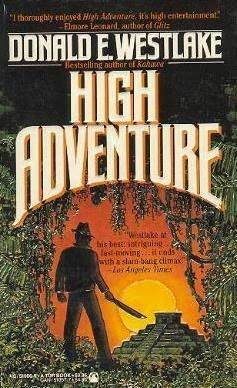 High Adventure, published by Tor books in 1985 and now out of print, is a neat (if not a bit dated) comic caper about smuggling artifacts, marijuana, corrupt government officials, treason, and mistaken identity. The story has a few central characters and just about all of them seem to be thinking the other characters are evil at one point. Sure, there aren't any real heroes at first because no one seems trustworthy, but that doesn't mean that these misunderstandings don't clear up later on and some characters really begin to shine. But if this story is to have a central character then I think it would have to be Kirby Galway. Kirby is pilot who lives in Belize and spends a lot of time flying marijuana into the the States. Once upon a time Kirby bought a tract of useless land under false assumptions from a man named Innocent St. Michael and has since been concocting a scheme to make some money off that useless land. What does this scheme involve? Why, smuggling pre-Columbian artifacts found in the Mayan temple on Galway's property to duped buyers from the States, of course. There's just one problem (among many) with this scheme: All of his prospective buyers are staying in the same hotel in Belize and Kirby must think of a way to keep them from running into each other. Innocent St. Michael is a land dealer and a con man in his own right and when he hears about a Mayan temple on Kirby's land he begins grow suspicious. How the hell could there be Mayan temple on the land Innocent used to own when there hadn't been one there before? Valerie Greene is an archaeologist and she believes there's an undiscovered temple somewhere in Belize. When she flies down there she gets put into a hotel where the prospective buyers for Kirby Galway's artifacts just happen to be staying. To make things more complicated, Valerie had already and accidentally met one of those prospective buyers with Kirby Galway in the States and the meeting did not go so well. The situation in the hotel is easily the funniest moment in the book, but the story doesn't end there. Vernon is a man who is gutless, but he's being paid off by a Guatemalan colonel to give information about Belize all while masquerading as Innocent St. Michael's dimwitted and overworking helping hand. War is coming to Belize and Kirby's troubles with his great temple scam might soon be reduced to ashes if he gets caught by the police. Or the crossfire of an impending guerrilla attack. Or if any of his buyers gets wise. Or if Innocent St. Michael gets wise. Or if Valerie Greene gets wise. If you can find this book then give it a read. I'm sure you'll like it and enjoy it. Maybe it's not the greatest comic caper Westlake has penned, but it's still good. My TBR list grows even more. It's really getting to be one hell of a list.